Had a really busy weekend on Friday, Saturday, and Sunday. Really so sleepy, I wish I was in bed now... Thank heavens for pre-written posts I can write in advance and publish later. Going to start keyboard workshop at this church group in about half an hour's time. The model you see in the photo is Yamaha PSR S950. The retail price is about Rm6.5k ish.. Not mine, but just using it to practise. Its got a lot of features that I am only beginning to learn to use. But now just learning to use the Sync Start, and Start/Stop, ACMP function. Basically the focus now is learning to play by ear, and memorizing chords for the different keys. If you are wondering, I learnt the organ under Technics for four years over. So the chords arent really a problem. Its transferring those skills onto a keyboard that is the tricky part. 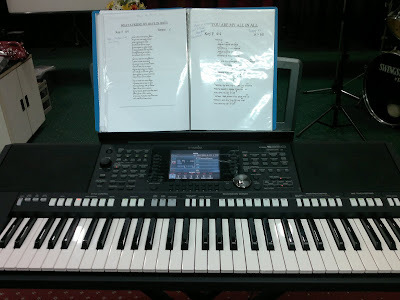 The trainer said that I was playing the keyboard like I was playing the organ, when I neednt do so, as it now comes equipped with the ACMP chord function. However for chord playing, we still referred to Hammond's Organ list of chords with the different inversions.. Heh. Turns out I am ill after all... wanted to go out but Providence was insisting I stay home to rest. Fever, sore throat, sore head.... basically slept in the entire day.